Yes we all do a lot of very stupid things, but the stupid things I’m talking about here are things we probably don’t think are stupid, but boy do they affect our pocket. Think SAA. We can’t close it down now because we’ve given it a bailout of R1.6 billion, we need to keep it running to recoup our investment. So we invested another R5 billion, and it’s still failing, but we can’t let it fail now, we’ve already invested R6.6 billion, we need to keep it running else that’s all wasted. So we invest another R6.5 billion, then another R4.7 billion, then another R10 billion. The more we waste on that airline, the more we feel obliged to waste on it, otherwise everything we’ve invested is “lost”. But here’s the thing, everything that’s happened in the past is already “lost”. When making investments past losses shouldn’t be a factor, you need to think from a clean slate. 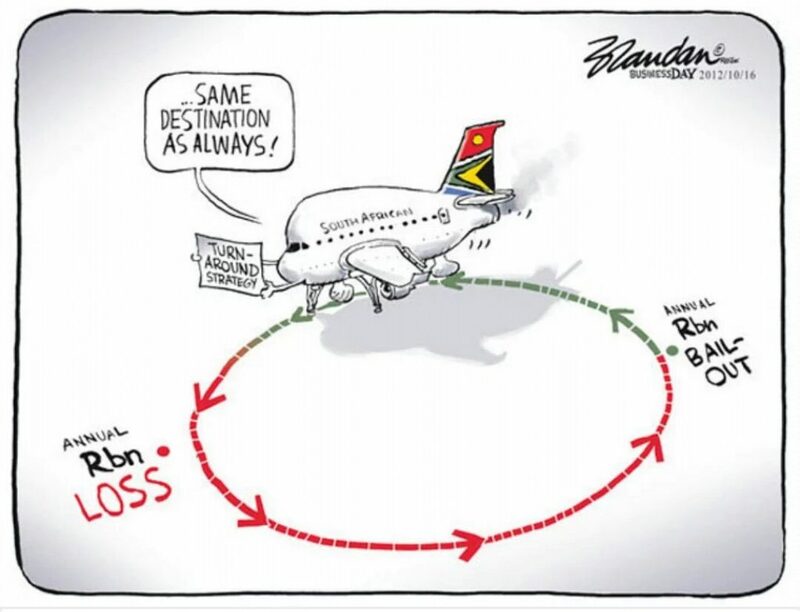 If SAA was an airline in another country, and they came to South Africa asking us to invest in it with it’s current record of loss making would we? Not a chance. Looking at it as an outsider we can see it would be a terrible investment, so why should we look at it any differently just because we’ve already invested as much as we have. I know there’s the job angle, but with 10 071 employees and R29.1 billion in bailouts so far that works out to around R2.9 million per employee. If instead of giving the first bailout we offered each employee a R1 million retrenchment package we would have saved R19 billion for SA! And that doesn’t even take into account the future bailouts we are sure to be paying for. Now of course you’re thinking that everyone in government is particularly stupid, that it’s a requirement on their recruitment forms to have an IQ below 80 and that you’d never fall for the sunk cost fallacy right? Remember that Emoji (or insert other stupid movie title here) movie you went to go see a couple of months back? You know how even halfway through when you knew you hated it but you thought you couldn’t walk out of the movie now because you’d already spent so much on the tickets. That’s the sunk cost fallacy. The ticket costs were lost whether you stayed or left. By staying you actually lost more, the ticket price and another 45 minutes of life you’ll never get back. Decided to quit smoking, but only after you’ve finished the last carton because it would be a waste to throw them out? Sunk cost! John is cleaning his garage and finds an unopened pack of Pokemon cards from when they were still cool. When opening them, he sees that one of them is a very rare Torchic, and on looking it up online and see it’s worth R5000! That’s so cool, but instead of selling it he frames it and hangs it over the bar in his man-cave as a cool talking point for when his friends come over. But what would have happened if he saw the same card in a shop with a R5000 price tag. He’d probably laugh and wonder which idiot would pay R5000 for a stupid old card. It’s you John, you’re that idiot. I know someone who bought MTN at R150 a share in 2012. A few years later it was up to R240 a share which made him very happy, but for the last few years it dropped to the low R100’s and very recently to R90 thanks to the big fine from the Nigerian government. The share had been flat for some time in the R120’s when I asked him if he was going to sell. Weirdly, he refused to let them go for anything less than he paid, and said he’d sell when it hit R150 again. Then I asked if he’d buy at the R120/share price it was sitting at and he said “not a chance”. Now clearly at the time he didn’t believe the share was worth paying R120 for, but for some reason the shares he owned were worth R150. That extra value something has when you own it is the endowment effect. The property market is full of this. For my wife’s version of fun, we went to go look at a house in Park-worst that has been on the market for over a year since the old owner moved to the Cape. He had a base price of R2.5m and wouldn’t budge under it at all. His best offer was R200k less be he was not going to sell that low. Instead the house sat empty while he kept paying rates and taxes, electricity and water. A quick back of the envelope calculation showed that if he’d sold at R200k less, he would have saved +-R40k in costs, and earned at least R180k in even a high interest bank account! Instead he still has this property. Every now and then he has to pay to get someone in to dust and clean. Some damp has appeared on a couple of walls, and the wooden windows are starting to rot. The area has also become less trendy and crime has also gone up recently. He’s probably wishing he still had that offer for R2.3M. In plain English: Marketers can make you choose a much more expensive option, by adding a worse option to the list. Your salary goes into one bucket, it’s responsible money that goes into expenses and then investments, but that bonus you’re expecting, that goes into the fun bucket, holidays, toys and nights on the town. Apparently when the petrol price went from $4 a gallon to $2 a gallon in the US, people started using a higher octane more expensive fuel type. It was like their fuel budget had to be spent on fuel. Surely money is money. How it comes in shouldn’t define how it goes out. We do this with our investments too. How many people have two buckets for their investing. 90% must go into my responsible investments, but I’m going to use the last 10% as my “play” money. These Beany Babies are huge not because they’re in a bubble but because they actually stop making certain of the characters and they will never ever ever ever make them again. Imagine how much Patti the Platypus will be worth when you can’t buy her in a shop anywhere. Industrialisation is revaluing the stock market. A leading economist Irving Fisher said it had attained “a permanently high plateau,”. He said this on Oct. 16, 1929. Black Tuesday was 2 weeks later. Sorry Irving, sorry all the shoe shine boys with your stock portfolios bought at 25 year highs. Dotcom’s don’t behave like regular companies. The Internet has revolutionised the economy. Companies don’t actually need to make profits, they don’t even need any revenue as long as they have eyes on their site. It’s a different world out there… until the year 2000, then it wasn’t actually that different anymore. Cryptos are a brand new investment class, that’s why they grow at 100% a month. Trust me, this time it’s different. It’s never different, you’re just wearing a different shade of rose tinted glasses.